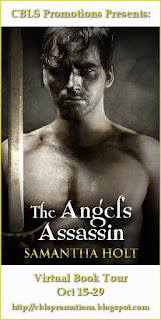 Today, Love Saves the World welcomes Samantha Holt who is currently on a virtual book tour for her book, The Angel's Assassin. A medieval story of love and betrayal. As a rebellion sweeps England, Lady Annabel finds her home overrun by rebels. Much to her relief, a dark knight comes to her rescue, claiming to have been sent to protect her by her uncle. But Nicholas holds a secret about the job he was sent to do and it is a far cry from what Annabel believes it to be. As the attraction between them grows, Nicholas begins to question the dark life he has lived. But is it enough to change him and will Annabel ever trust again after learning the true nature of his sinful duty? He had never given a woman a gift before and he had felt apprehensive when handing it to her, but her look of delight had brought a warmth into his heart that he had never experienced before. He had only intended to get her something simple and warm but the gown had reminded him of Annabel - gold and sparkling. It had cost him plenty of coin, mayhap more than it was really worth, but he knew if he had the chance he would happily spend his entire fortune on pretty gowns if it garnered the same reaction. But it wouldn’t be up to him. Nicholas had to remind himself of that. He was to protect her, naught more. “Nicholas?” Annabel’s voice beckoned to him, curling around his heart. He took a deep breath, sucking in the cool, crisp air, hoping it would provide him with the necessary courage to face her. Each moment in her presence was making it harder and harder to fight the sweet temptation of her beguiling kisses. His strength to resist was steadily waning, but he knew he had to be strong. It was not intended for someone like him to receive the honour of her affections. They were undoubtedly misplaced and she would realise that if she understood his true nature. But he could not reveal it to her, for she would surely send him away and then how would he fulfil his duty to protect her? Turning around, he dipped his head to enter through the small doorway of the hut. Though it was dark, Annabel seemed to shine through the gloom, all available light glinting off her flaxen hair and golden gown. As she heard his footfalls, she turned her head, looking at him over her shoulder. Moving to her side, she lifted her arm as he twisted the laces up her side with trembling hands. Annabel watched him as he did so, her bright eyes never leaving his face. He halted, his jaw ticking as he clenched it. Unable to meet her doe-eyed gaze, he stared at the ties in his hands. Annabel twisted around to face him and he let the laces fall from his grasp. Her hand reached up and grazed across his jaw, drawing his eyes to hers. The milky expanse of one shoulder was just visible and his gaze darted down, drawn to the enchanting sight of bare skin. Nicholas’ hand shot out before he had even realised was he was doing and it hovered above her shoulder, itching to touch it. The heat of her skin seemed to penetrate the gap and his hand shook with restraint. He looked at her in surprise and noticed a hint of vulnerability dancing in her expression. “God, nay,” he rasped. His hand closed the gap in a sudden rush of movement, pulling a gasp from her while he groaned at the feel of soft flesh under his hand. 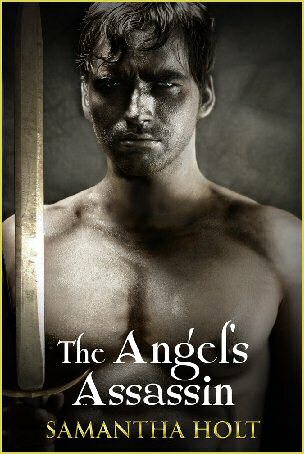 Samantha Holt is giving away 5 e-book copies of her book, The Angel's Assassin. Nice excerpt ! Sounds like a book I want to read... I love historical romance ! Thanks for your kind words, Lorraine! And thank you for having me, Tin! Thank you for the opportunity! Congratulations on the The Angel's Assassin!